Running a photographic workshop successfully is no mean feat. It takes skill, patience, diplomacy but above all, endless amounts of energy. Take out one of these ingredients and you can have a recipe for disaster. This is exactly what happened to me last month in Venice when I was hit by a nasty dose of the flu which left me stuck in a hotel room for four days. Thankfully, for me and my clients, my good friend and second tutor Mike Bell kindly stepped in and took over the running of the workshop single-handedly. Cheers Mike, you saved the day! Now having safely arrived back in Scotland, and with the snow storms hitting outside, it’s time to get to work putting the finishing touches to our February issue. With most photographers now having their own websites, how can you stay ahead of the rest and showcase your images? If you are thinking of having your own photographic exhibition, Richard Burton shares his valuable advice on what to consider and how to get yourself noticed. At the other end of the scale, gallery owner Jon Gibbs gives us his insight into how to run your own successful gallery. Terrascape are a fairly new company to the photographic arena and their filter bags recently caught our eye so we put them to the test. Find out if they lived up to our expectations. Also in this issue, we were thrilled to talk exclusively with top mountain landscape photographer, Alex Nail, about his passion for high-altitude adventure, the art of wild camping and what it takes to get these incredible images. Finally, we bring you the best images from the Neutral Density Photography Awards. 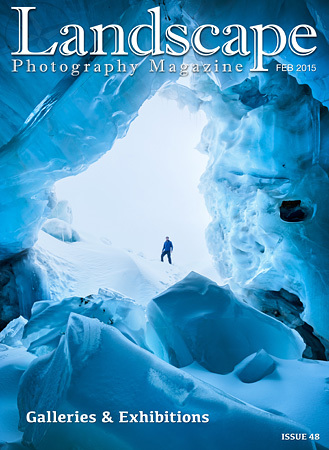 So, grab yourself a coffee and enjoy Issue 48 of LPM. Mike Bell reviews a set of three different Filter Holder bags by Terrascape. Our question is, are they exactly what landscape photographers need? You rushed to the iconic spot and you took the same picture as everyone else. So, you got the shot but what about the real photography satisfaction? Start pursuing your own artistic vision instead of chasing photographic icons made famous by others – you might discover the icons of the future!